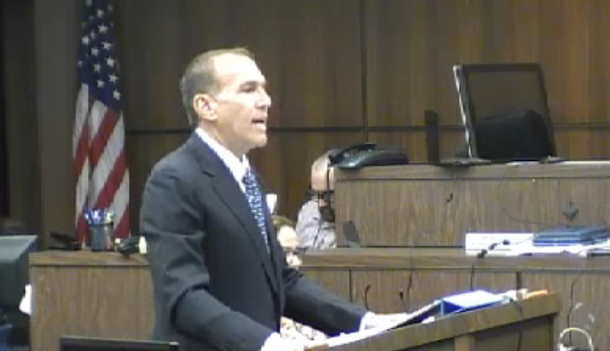 Scott Schlesinger delivers his opening statement at trial in Marilyn Oshinsky-Blacker's claims that the nation's two largest tobacco companies are responsible for her husband, Dennis Oshinsky's, cancer and death. Fort Lauderdale, FL—Attorneys debated what drove a Florida merchant who spent much of his career selling cigarettes to smoke himself, as trial over his lung cancer opened this week against the nation’s two largest tobacco companies. Oshinsky-Blacker v. R.J. Reynolds, et al., 2008-CV-025841. Dennis Oshinsky, 60, a Florida merchant who began smoking as a teenager, died in 2000 following multiple battles with brain and lung cancer stretching back seven years. His wife, Marilyn Oshinsky-Blacker, claims a decades-long scheme by Reynolds and Philip Morris to hide the dangers of cigarettes caused her husband’s nicotine addiction and death. Throughout much of his life, Oshinsky worked at stores that sold cigarettes, first at a family-run pharmacy, and later in a sundries store that sold tobacco products. The defense argues Oshinsky, as a successful merchant, was not duped by tobacco marketing or forced to smoke by addiction, but chose to smoke despite knowing the dangers of cigarettes. “Was he somebody that continued to smoke because he was compelled to out of addiction, or was he somebody who, as he said to his brother… loved every cigarette that he smoked?” Reilly asked. The case is one of thousands of similar Florida lawsuits against U.S. tobacco companies. They arise from a 2006 Florida Supreme Court decision decertifying Engle v. Liggett Group Inc., a class-action tobacco case originally filed in 1994. Although the state’s high court ruled Engle cases must be tried individually, it found plaintiffs could rely on certain jury findings in the original verdict, including the determination that tobacco companies had placed a dangerous, addictive product on the market and had hidden the dangers of smoking. To rely on those findings, individual Engle progeny plaintiffs must establish a causal link between deceptive tobacco marketing, addiction, and smoking-related disease. Trial in the case is expected to last at least two weeks. Marilyn Oshinsky-Blacker is represented by Scott Schlesinger and Jonathan Gdanski, of The Law Offices of Sheldon J. Schlesinger, P.A. Philip Morris is represented by Shook Hardy & Bacon’s Kenneth Reilly. R.J. Reynolds is represented by Womble Carlyle Sandridge & Rice’s Geoffrey Beach.